Line a large rimmed baking sheet with wax paper; set aside. Fill a large saucepan with about 2 inches of water; bring to a low boil. 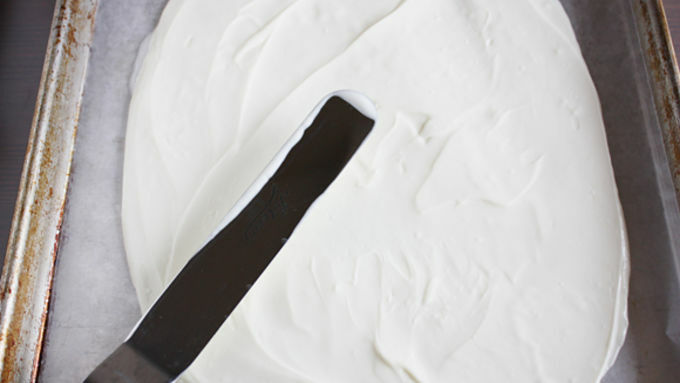 Add white chocolate chips to a medium saucepan and hold it just above the boiling water to create a double boiler (do not let the bottom of the saucepan touch the water). Stir the white chocolate chips until melted and smooth. Pour chocolate onto prepared baking sheet. Use an offset spatula to quickly spread chocolate into a thin, even layer on the baking sheet. Place baking sheet in the refrigerator for at least 1 hour to set. Repeat Step #2 for the dark chocolate chips (use a clean saucepan). Quickly spread the dark chocolate over the white chocolate in a thin, even layer. 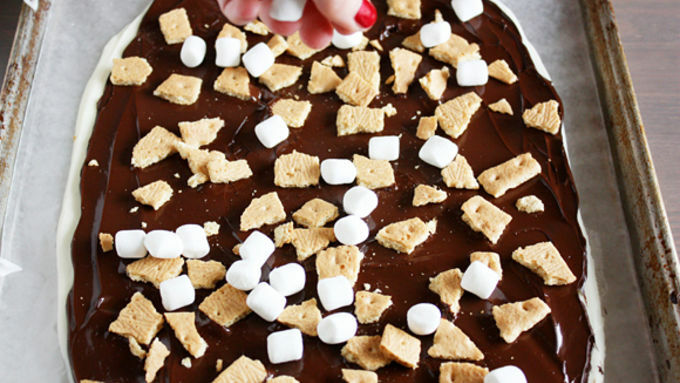 Immediately sprinkle graham crackers and marshmallows on top (you may not use all of them). Return baking sheet to refrigerator for at least 2 hours to set. Remove baking sheet from fridge and, using the tip of a sharp knife, carefully break chocolate into pieces to serve. You know by now that I kinda have a thing for s’mores. I can’t get enough of that flavor! 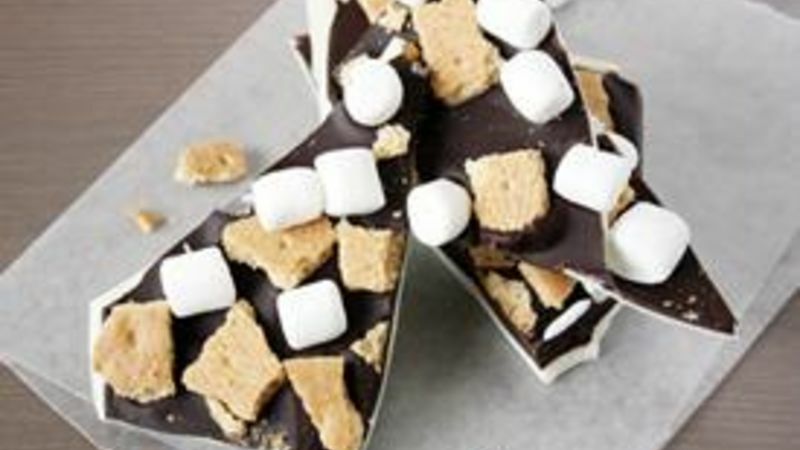 Mallows and grahams and chocolate—oh my. 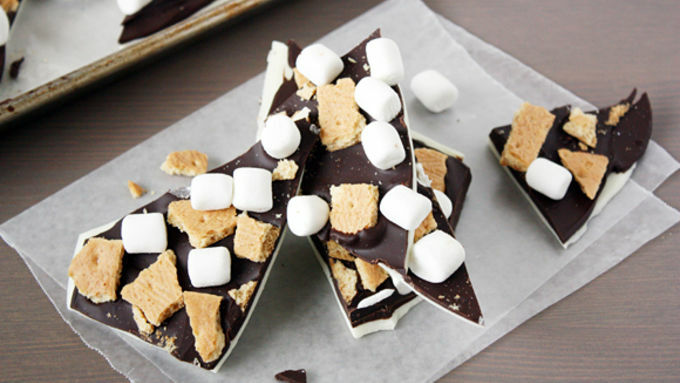 So when I decided to go the edible gift route for Christmas this year, I just knew S’mores Bark had to make the cut. Here’s something you should know about making homemade chocolate bark: It’s the easiest thing to do EVER. And it looks pretty fancy, too, so people will likely think it came from a real-live candy shop. Take all the credit and wow them with your newfound chocolatier skills! This is one seriously delicious holiday gift – for your friends, for your family, for that weird neighbor across the street, for Santa on Christmas Eve, even for you. Let’s spread the chocolatey Christmas cheer! Divvy it all up among a few bags to give away as gifts, serve it at your next holiday gathering or keep a stash for yourself (I promise I won’t tell). One bite and you’ll be singing Christmas carols about s’mores all the way through the New Year!